It’s been three years since the last Summer of Sonic, but this year the UK-based Sonic the Hedgehog convention was brought back for “One More Run” thanks to a Kickstarter campaign that reached half the requested amount inside 5 hours, and smashed the intended target by over another 50% on top. 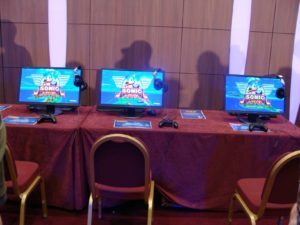 Clearly the fan demand was still there 3 years on, and excitement about the show reached fever pitch when it was confirmed shortly after the 25th anniversary party in San Diego that our friends at Sega America had generously supplied some demo pods for Summer of Sonic – attendees would be the first in Europe to play the hotly anticipated Sonic Mania. So, how’d the event go? Let’s find out, shall we? I arrived in London the afternoon before before the show, though for once Great Western Railways (and by extension Network Rail) were actually smooth and efficient for every train journey I did the whole weekend: I guess there’s a first time for everything! Following a hotel check-in and a bit of time-killing wandering around London (and checking the route to the event location), I met up with a bunch of fellow Retro members for a pre-event drink at a pub we’re familiar with. Following last orders, we all went our separate ways and prepared for the organised chaos to come the following day. Upon getting into the ILEC Conference Centre lobby the next day (event guests filing in as we queued, such as Jun Senoue and Takashi Iizuka & Yuji Naka, the latter wearing a stylish Ferrari-logo emblazoned backpack), we were greeted with the usual goodie bags, this year containing a free download of Sonic Generations on PC, an StC poster comic by the guys at Sonic the Comic Online, a wristband and the all-important event programme. There was also an event-exclusive T-shirt for those who’d added one to their Kickstarter tiers (as I had done). We all filed inside and Retro being Retro, immediately made a bee-line for the Sonic Mania queue as the hall filled up and the start time drew ever closer. Finally, the show began, with the countdown this year themed around community members (as after all, they’d funded the show!) Cheers periodically rang around for certain favourites popping up on the list, with a certain game starring a fishing-loving cat getting one hell of a loud cheer when it popped up in the #3 slot. As it happened, 3 members of the Big’s Big Fishing Adventure 3 development team (all the UK-based ones) were at the show, and I have it on pretty good authority that all three were delighted by the crowd reaction on that! The countdown over, Svend and Adam (aka Dreadknux & T-Bird) came out and officially opened the show – this done, the Mania demo pods were turned on and the queue started rolling forward as Mike Pollock, voice of Dr. Eggman (amongst others) took the stage for a Q&A session. 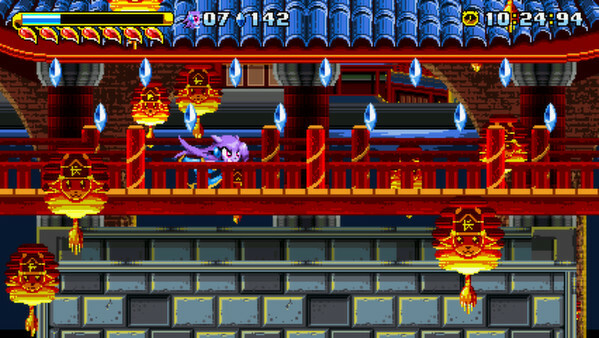 A game released by Sega in the style of Sonic Mania is something most of Retro has been waiting a long, long time for (arguably since after Sonic 3 & Knuckles came out back in late 1994), and we took to a pod seat, that wait finally over. Retro & Segabits have covered Mania reactions elsewhere twice already, so I’m not going to do a third separate post on it like I’ve done for games in the past, but I’ll echo what the 25th party-goers said – the game is visually gorgeous, plays like a dream, and I was at home with it straight away, zooming around Studiopolis (the choice for most people, it has to be said, over the alternate Green Hill Zone – even to the point that Stealth, who was at the show, specifically tweeted about it!) The game is in safe hands under Christian Whitehead & Simon Thomley (not forgetting PagodaWest! ), and I look forward immensely to playing the final product in 2017. We exited the Mania booth and started exploring the rest of the show, stopping at the merch stand and picking up a few pieces (and I grabbed a signed print from Duncan Gutteridge too), before briefly nipping out for some lunch at the handily-located upstairs pub – sadly Totinos aren’t a thing in the UK, so we settled for beer and burgers! 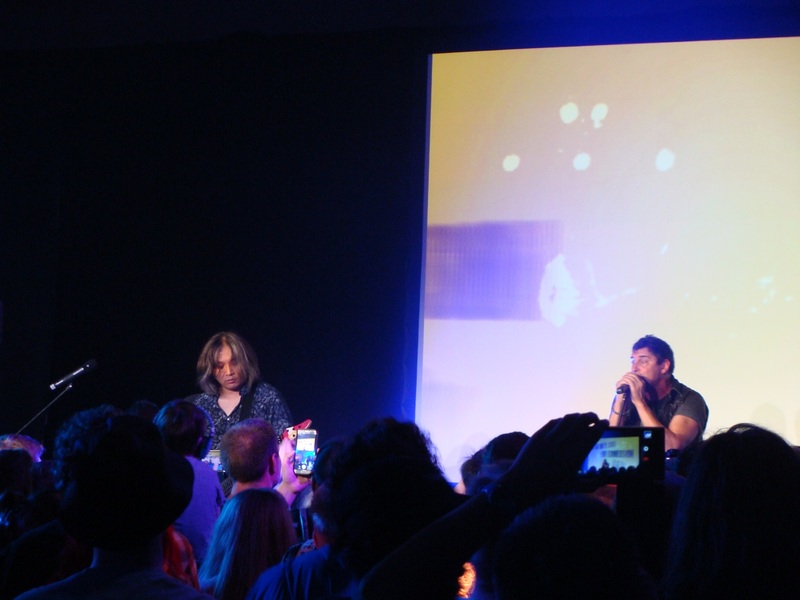 We returned to the hall floor to get into the queue for the Mike Pollock signing as the Jam with Jun set started up, the guitarist banging out a few favoured pieces such as Emerald Coast, the Chaos 6 battle, and Pyramid Cave; ending with a sing-along of the Generations version of City Escape. 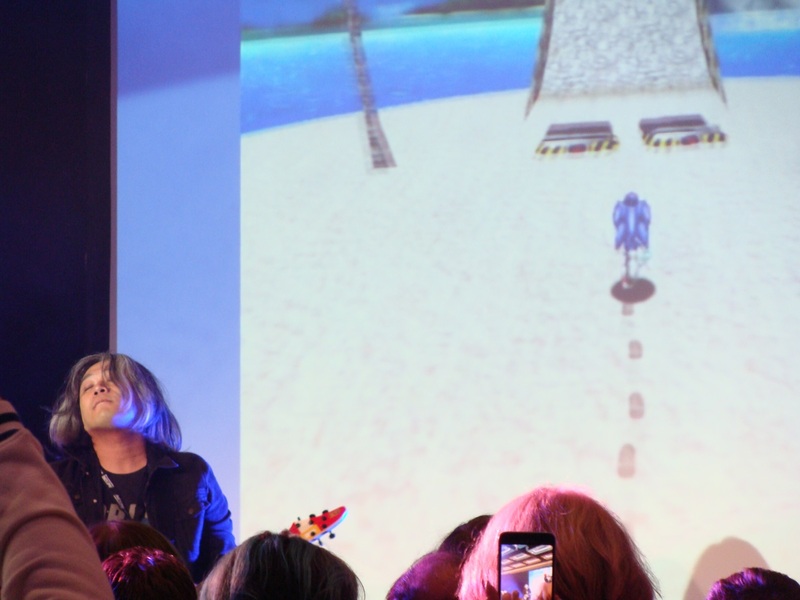 Sadly the signing queue for Mike got closed just as I reached the cut-off point, but that’s just one of those things – I moved onto the Crush 40 queue as Jun left the stage to join Johnny Gioeli for signings. 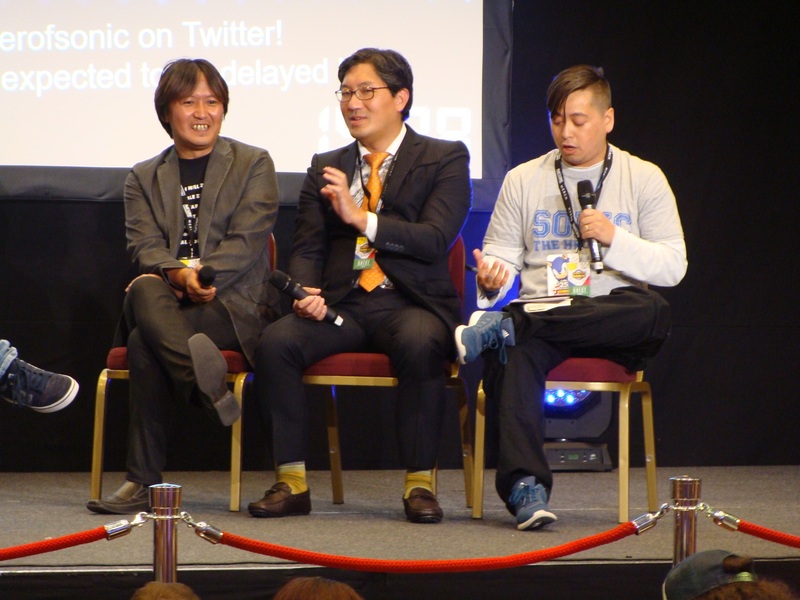 Taking their place on the stage were Naka-san and Iizuka-san, who fielded some questions about the franchise, including the fan reaction to Sonic Mania amongst other things (a special mention here to the shouter of “Sonic Mania 3 & Knuckles!” from the audience on what they’d like to see going forward!). 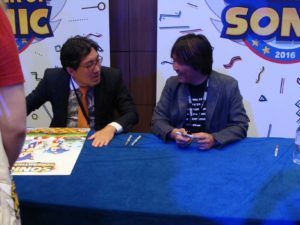 On being asked if he’d ever work on another Sonic game again, Naka-san answered “Maybe someday” – something to watch out for, perhaps. 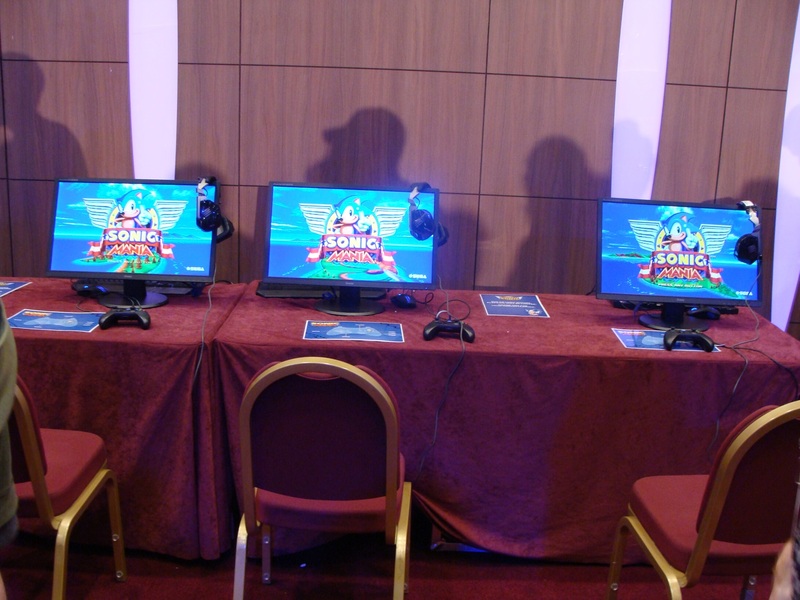 Immediately following this, a Sonic Runners-style roulette wheel popped up on-screen, the two developers each being invited to “have a spin” – the wheel landed on Sonic for Iizuka-san and a cake for Naka-san, and a huge birthday cake was dutifully brought out as the pair posed for photos on stage with Sonic. This concluded, there was a brief lull before the pre-concert signoff of the show, and at this point I finally got to the signing tables – third time being the charm! Though they’d stopped doing camera posing for time, I did get my Sonic 1 manual signed by Naka-san and my Sonic Adventure 2: Battle manual signed by Iizuka-san. 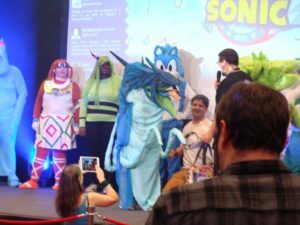 The Sonic Retro group then retreated to the corridor just outside the main hall to regroup and get a brief drink as Club Sonic started up, and re-entered the hall again just in time for the closing Crush 40 performance. Seeing a Crush 40 performance is always a treat and the pair didn’t disappoint, belting out a selection of their hits including Open Your Heart, His World, Sonic Boom, All Hail Shadow and Live And Learn, before finishing (“Who’s going to make us stop? Oh, Adam might. Sorry Adam. One more song?”) on a crowd favourite of What I’m Made Of. And with that, the show was over, and we all gradually drifted out onto the still bright streets of London – well, the general audience did. Retro having discovered the pub upstairs earlier in the day, we decided that would be the best place to retire to for the post-show drinks! Relaxing after a long and tiring day, we reflected on how well the day had gone and shared experiences we’d all had. All good things must come to an end however, and we all bid each other farewell as we walked out into the cool London night air. In conclusion, the Summer of Sonic team has once again put on one hell of a show and found a way to top the last one – much love and respect goes out to Svend, Adam, all of the guests, and all the cast and crew behind Summer of Sonic 2016 – thank you all so much for doing this for everyone, on behalf of all of us at Sonic Retro & Segabits. Hopefully we’ll see you all again next time, but if 2016 does turn out to be SoS’s swansong (given the three year gap since the last one), the show has certainly been worthy of that title. 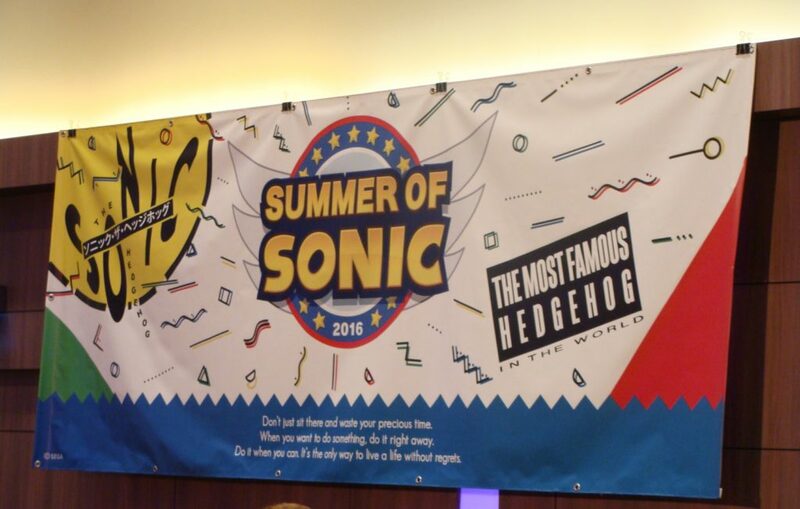 I’ve always had a certain respect for Summer of Sonic, unlike the other events out there, SoS was made by the fans to the fans. 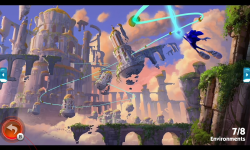 btw that Sonic boaster at the beginning, is that a new art? 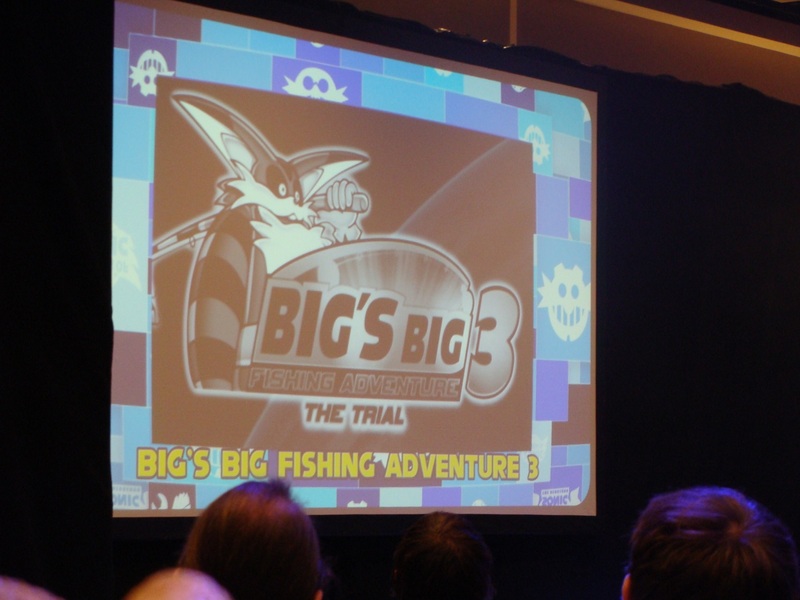 I don’t think I’ve seen this one before, I now wanna see if there’s a stream of this whole event. 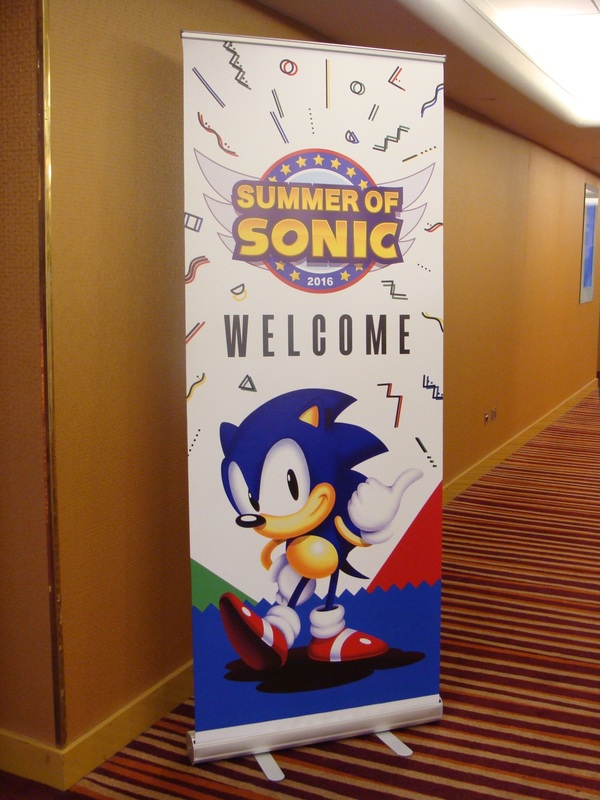 The Sonic art on the SoS Nimloks is by Mark Hughes (SonicMark); the design work in general was by Mark and Kieran Gates (Gatestormer). 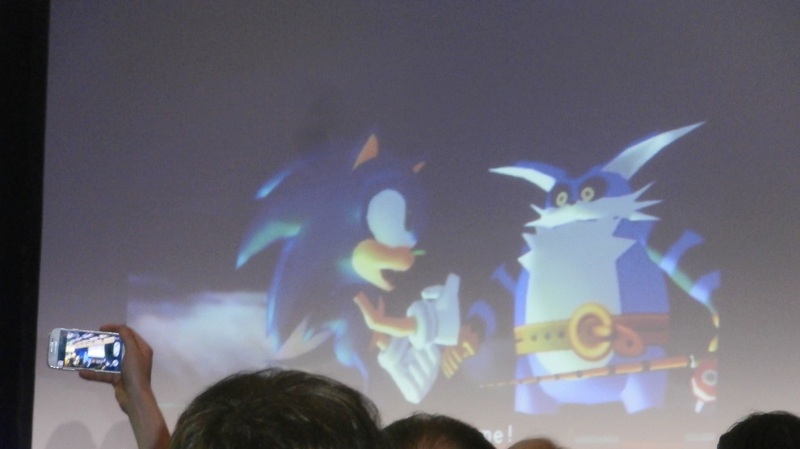 So, apologies, not official art, though I believe they do have the blessing of some of the people at ST that worked on Sonic’s design in the 90s, so, not too far off I guess? However, we had audio issues (worse than the 25th Anniversary Party unfortunately) for the first few hours, as we finished Friday setup really unhappy with the audio and tried a different solution on Saturday that took a while to figure out. Thankfully it was mostly fine for the events that really mattered. We also had thermal throttling problems that affected both the projector system and the streaming system – in hindsight our volunteer-sourced laptops weren’t powerful enough for the job. But if you can live with all that, it’s a nice enough watch! We’ve also got proper recordings (basically the stream, but in 1080 at 50fps), which we’re still working on, so that might make a bit more sense when they get posted on YouTube. 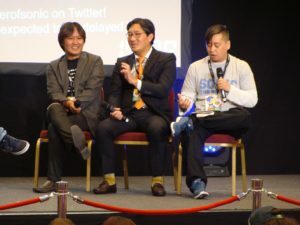 A very good review of this fantastic event. Thank you. No problem at all! We all had a fantastic time & we know how much the crew struggles through to put on these shows for all of us.